Consider being alone, still, in complete silence. It can be a precious relief, a lovely respite from noise, and busyness, and demands, and people. I need such times, but they are rare. Occasionally I turn off my phone, shut down my laptop and find a quiet spot to sit where I won’t be interrupted for a while. That can be refreshing, but the stillness in those moments is never fully still. My devices may be silenced but my brain isn’t. Inside I’m pretty much as busy, as focused as ever and the noise inside my head keeps on, brain-box chatter that has a life of it’s own. For that to be stilled, I have to be in the second week of time away in a quiet place like a cabin in the country. Yet the writings of poets and mystics all suggest the level of stillness I achieve in that second week is only a hint of the quiet that is truly possible when you really give yourself to it. In some seasons of life even brief moments of stillness, snatched here and there amidst the unrelenting busyness is all we can muster. Small children have needs, emergencies erupt into our schedules, and vocations take us into urban centers where background noise and movement are unceasing. And some who are single and far from family need time away not alone at a remote cabin but with friends where for a few days they are never far from the lovely, unceasing clamor of loving community. My experience, for what it’s worth, is that being alone recharges and refreshes, and the stillness permits me clarity to experience just a glimmer of the immense mystery of reality. The stillness I enter that second week is a silence of intense discovery where creativity is renewed and the quiet reality of God is met in some renewed way. Here is a paradox: it is entering stillness, a silence when I am alone that reassures me I am not alone. It is stillness replete with signals of transcendence, a silence that is also a voice, if I have ears to hear. It is in being alone that I am most aware that someone greater is not far off. The ancient seer of Israel, Elijah, hunted by an enraged queen whom he had royally offended by speaking truth she refused to accept took refuge in a remote cave in the mountains. It was not the first time he had run for his life, and he waited, alone, for an experience of God. How I love that question. The one who did not need to ask a question and listen to the answer for he knows all asked Elijah to tell his story. And God reassured him he had not been abandoned to the whims of a wicked ruler. Elijah heard God in a “gentle and quiet whisper,” a “still, small voice” (as other translations render it). I am not suggesting my experience is parallel to Elijah’s for I am no prophet and have heard no actual voice, but the sense of the text makes sense to me. It is when I am most alone and still that I am reassured I am not alone. And of course, on the other hand, being alone and still, in complete silence can also be terrifying. This is the suffering of those who are forsaken and abandoned. All who walk that path are wounded by the experience and some never make it to the other side. This aloneness is a curse rather than a blessing and is also known in scripture. The first negative statement made by God recorded in the Bible is found at the very beginning in the creation narrative. “Then the Lord God said, ‘It is not good that the man should be alone’” (Genesis 2:18a). It’s clear from the rest of the passage he was referring specifically to Adam’s need to live in a world populated with life, with animals and plants and especially with fellow creatures like himself made in God’s image (see Genesis 2:18b-25). The point is that we were not made to be in an empty cosmos, and we will never be fully comfortable in one. The individual person has significance but is always found in community, in relationship. We need people, and the teeming life of nature to feel at home. But there is also a deeper sense of emptiness implicit in the story of creation. The ultimate nature of reality —what is really real and behind all things—is one God in three persons. “Let us make man in our image, after our likeness,” the Creator said (Genesis 1:26). This means that living in a cosmos empty of the divine is an ultimately lonely place to find oneself. Voices that come later in scripture trace themes related to being alone—being forsaken or abandoned—with stark impact. For example, a Hebrew poet is harassed by those who wish him destroyed, and cries out when God seems absent. To be forsaken by God is not merely to be alone but unprotected in a hostile world in which death haunts our steps from the moment of our birth. “O God,” the psalmist pleads, “be not far from me” (Psalms 71:9-12). Artists have often explored this idea. Watch and discuss two films, for example, that brilliantly imagine, in very different settings, living in a world in which God, if he exists at all, is silent, aloof, uninvolved and distant. The first, The Silence (1963) was written and directed by the great Swedish filmmaker, Ingmar Bergman (1918-2007), who was raised in a Christian family but later turned away from confidence in God. The second is Silence (2016), written and directed by Martin Scorsese, based on the powerful novel of the same title by the Christian Japanese author, Shusaku Endo (1923-1996). Both films allow us entrance into the horror of being ultimately alone, abandoned by the divine in a cold and impersonal universe. This is, in novelist Walker Percy’s words, what it means to be lost in the cosmos. The prophet Jeremiah, speaking at a time of political uncertainty, division and violence describes cities depopulated, forsaken by citizens who have fled (e.g., 4:29-31). The media has recently carried stories of desolate cities in the Middle East, once teeming with people and commerce but now derelict and destroyed. The photos of empty streets are eerie and unsettling, and somehow less than fully human. In some cases journalists report that snipers cut down civilians fleeing the carnage, so that the bodies of women, men and children rot in alleys and once busy thoroughfares. I cannot begin to imagine what it would be like to feel so forsaken, so alone, so frightened. To be also abandoned by God in that moment would be reason for total despair. The poet king, David, knew suffering—physical, emotional and spiritual—in his lifetime, and expressed the depth of it in a poem that has long been recognized as foretelling the coming of the Messiah. He wrote out of his own personal experience yet transcended it, so that his cry became a greater cry that echoed through the generations. David’s words came full circle when Jesus spoke them, crying out over God’s abandonment that was far beyond David’s greatest nightmare (Matthew 27:46, Mark 15:34). Here I enter mystery far beyond my comprehension, and yet I believe. I may only guess at what it is like to live in a world utterly without windows, separated from the Father—hell, really—but Jesus actually went there and knows. St. Paul, ever the realist, spoke of going through hard times. “We are afflicted in every way,” he wrote, “but not crushed; perplexed, but not driven to despair; persecuted, but not forsaken; struck down, but not destroyed” (2 Corinthians 4:8-9). He was beaten, jailed, stoned and left for dead, and yet even in the face of such hostility, when all those arrayed against him seemed to have the upper hand Paul was not abandoned by his Lord. His suffering had a greater purpose, a transcendent meaning whereby “we who live are always being given over to death for Jesus’ sake, so that the life of Jesus also may be manifested in our mortal flesh” (4:11). In sharp contrast, in a world without God such suffering can only be a miscarriage of justice, or perhaps being on the wrong end of the survival of the fittest. God’s particular care for orphans and widows throughout scripture is a metaphor for how he is concerned that the most vulnerable and powerless among us not be abandoned or forsaken or alone. The Lord your God is God of gods and Lord of lords, the great, the mighty, and the awesome God, who is not partial and takes no bribe. He executes justice for the fatherless and the widow, and loves the sojourner, giving him food and clothing. Love the sojourner, therefore, for you were sojourners in the land of Egypt (Deuteronomy 10:17-19). Not surprisingly the Hebrews knew God as “Father of the fatherless and protector of widows” (Psalms 68:5). And even when the powerless struggled to make their way in an unjust and selfish world, they had reason to hope in God. “For my father and my mother have forsaken me,” David laments, “but the Lord will take me in” (Psalms 27:10). We were not meant to live in a world without God and so will be restless and uneasy if we find ourselves so alone. Today we live in an era of “exclusive humanism.” This is the term coined by Charles Taylor in A Secular Age to refer to the belief that human meaning and purpose can be found entirely apart from any reference to the divine. In other words, more and more people assume that life and existence simply occur naturally, and no God or gods are needed to make sense of things. It’s the way they imagine things to be even before they begin to think it through—what Taylor calls their “social imaginary.” Our social imaginary—we all have one—is shaped by stories and by what seems to fit our experience of life. And in our post-Christian world, more and more of our neighbors, colleagues and friends hold a social imaginary that assumes that unless scientists find evidence of life somewhere out in deep space human beings are alone in an immense and expanding universe. But there is more to this story. Science has shown us something of the immensity, the incredible vastness of the universe. Discoveries seem to come in a flood, amazing glimpses of the order and beauty of the cosmos in all its complexity. We wonder at the immensity of it all, and try to comprehend what it means to exist in a rapidly expanding universe with dimensions that beggar our imagination. The universe is impossibly huge and coldly impersonal while we are tiny, infinitesimal if viewed across the grand reach of numberless galaxies and endless time. And that is the problem—these discoveries, all so wonderful, also make us seem smaller and insignificant as a species. And unless some unknown, advanced species has discovered us it turns out we live and die on a tiny, obscure planet unnoticed and unremarked. Eventually, we are told, our sun will die and life on planet earth will blink out. Add the threat of extinction from some pandemic, or nuclear or ecological disaster, and our significance as a species becomes tentative at best. But even this is not the end of the story. The social imaginary of the Western world used to be shaped, at least in part, by Christianity. And Christianity insisted that human beings were made in God’s image; that Christ the second person of the Godhead became a man; and that God was at work in human history as redeemer and king. This meant that there was a divine focus on us that brought significance, purpose and hope. The earth mattered so much that Christ died so there might be someday soon a new earth, renewed and restored in glory. But in a post-Christian world, this too has been lost, or set aside. And that is one more way that the modern sense of being alone in the cosmos is sharpened. As a Christian I would argue we were not made to fit comfortably in such a world. We are not meant to be alone, in a universe where there is no God or gods, no transcendent, no realm of the spirit in which warfare is waged against evil until truth and justice prevails. Subtract all that from reality and existence threatens to become not merely meaningless but boring. Cause and effect plodding mindlessly forward, though time towards extinction. The Christian view is that human beings are creatures who worship, must worship, must center their lives and hearts on something, and if there is nothing bigger than ourselves, we are lost. So, there are two stories on offer. One story says that we are alone in the cosmos; the other story insists we have not been abandoned. The first, it seems to me, is not merely the less satisfying of the two, but is actually rather boring. It could never generate a vision of reality as exciting as St John’s Revelation. This is a story that goes beyond matter and energy and random particles to cherubim and seraphim, dragons and pale green horses, iron clad locusts that sting like scorpions, seven headed beasts, witnesses in sackcloth, whores and virgins, demonic hordes and angelic hosts, an epic battle at the end of days when all creation is renewed in glory, and the consummation of God’s kingdom when the seen and unseen worlds are fully known, and evil is vanquished and death consumed and justice fills the earth like the waters cover the sea, world without end. And that, I would argue, is just about as far from boring as you can get. In 1945, at the end of World War II, C. S. Lewis published the last volume of a trilogy of science fiction novels. The first, Out of the Silent Planet (1938) is set on Mars, introduces us to the setting and characters of the series and helps us see the Christian doctrine of creation in a new and sharper light. The second, Perelandra (1943), set on Venus, follows the same hero, and unpacks the nature of the fall. The third, That Hideous Strength: A Modern Fairytale for Grown-Ups (1945), set on earth, completes the narrative and explores a world in which science and technology has taken the place of Christian faith. This series of books is very significant to me. I first read them as a young man and they fired my imagination with how fiction in general, and science fiction in particular could unpack the biggest questions of human existence. The hero in the series is a philologist named Elwin Ransom, and that is how we got the name of our ministry, Ransom Fellowship. Margie and I decided we wanted to be in the fellowship of those who stood with this character in the service of the truth. In That Hideous Strength, Lewis proposes something that is rarely considered but that I am convinced is accurate. He proposed that when a modern Western society becomes post-Christian, it tends to drift towards paganism. Which makes sense if you think about it. Human beings are not meant to live in a world where no transcendent is possible. Naturalistic science causes us to focus, naturally, on nature, on natural forces, events and processes. And paganism is an earth-shaped spirituality, with myths born out of natural phenomena and finite gods to explain the natural, ordinary things that seem mysterious, overwhelming and threatening to ordinary people. I do not think this means that pagan temples, complete with sacrifice and rituals will spring up any time soon in America. Rather, it seems more likely that a broadly pagan mindset will tend to shape the social imaginary of increasing numbers of people. Certainly an interest in classic pagan gods is a major theme in popular culture. Think of movies like Thor (2011) and Marvel’s Avengers (2012). Books like Neil Gaiman’s novel, American Gods (2001) and his retelling the old stories in Norse Mythology (2017). Recently I watched season 5 of House of Cards, a Netflix series set in Washington that reveals officials inside and outside of government to be cynical and amoral, interested only in achieving and maintaining power. Episode 3 opens at a private, luxurious retreat where only the wealthiest and most powerful individuals in business and politics assemble for a long weekend to strategize and network. The retreat opens in the woods, with a pagan ritual complete with torches, chants, a looming statue, and masked, robed participants. Only after that is completed do the intense discussions and negotiations begin. What is striking to me is that this scene appears in a series that does not indulge in irrelevant or extraneous subplots but is highly focused on exploring the heart of amoral power in the cynical world of advanced modernity. I don’t want to overstate this, but as someone who has tried to keep a finger on the pulse of American culture it feels to me that the yearning of the heart for something more is behind all this. We are not made to exist in a boring universe, and when we find ourselves in one, we look for stories that will relieve the boredom. We need such stories, and indeed cannot live without them. The desolation at the end of days is not signaled by the appearance of monsters but by the lack of stories of heroes who will save us from them. So, it is a wonderful time to be a Christian. Our story—the myth that is really true—is actually about the hero who not only can best the monsters but who already has. Repeatedly over the past two millennia God’s people have faced paganism and repeatedly the gospel has bested it. The tomb remains empty confirming our story, God’s Spirit remains with and in us enlightening our telling of it, and the gospel remains divinely powerful to work redemption, which is our confidence. We can speak this story creatively into our culture as it becomes enamored with pagan myths. And it is the very best story, a story that takes all the great themes of the pagan myths and shows them fulfilled in Christ. The Christian story promises an end to the horror of aloneness in an empty and boring cosmos. If it doesn’t seem that way, I suggest we just need to learn to tell our story better. And for that I have four closely related and interlaced suggestions for our growth in the gospel. We can learn to see clearly and speak truly. Part of the problem may be that too much of the time we talk as if we are secularists. Please don’t misunderstand: at times we need to speak like secularists because so many of our neighbors are secularists. Just as a missionary learns the local dialect so we must do the same if we are to share in the mission of God. Certainly we don’t want to insist that our non-Christian neighbors first learn our narrow religious dialect that is spoken in most churches. Still, it won’t do for Christians to speak in ways that sound as if we are secularists who happen to hold private beliefs about God. The Christian perspective on life and reality is vastly different—in some ways boldly antithetical—to a secular perspective. That difference must not be masked, and can be expressed in creative, intriguing ways. Perhaps we aren’t steeped enough in the truth of God’s word, in terms of our assumptions and presuppositions. Serious regular Bible study in community is essential if the biblical story is to inform and shape us. Perhaps we are trying too hard to sound inoffensive in a world where the dominant perspective is shaped by exclusive humanism. There is hostility against Christian faith so we need to review the meaning of Christ’s call to us. “If anyone would come after me,” Jesus said, “let him deny himself and take up his cross and follow me” (Matthew 16:24). Perhaps we aren’t doing the hard work of figuring out, in community with other believers, creative ways to live out and speak about our faith in ways that might intrigue and even surprise non-Christians. Our secular world sees politics as the primary way to enact change in society, and so has a tendency to politicize everything. We must quietly but insistently refuse this vision of life. It is essential that we resist the politicized, secular dream of using legal and political means to enforce Christian values and ideas on fellow citizens who reject our faith in an effort to re-Christianize America. It is redeemed people with changed hearts and transformed lives that will transform the culture, which will transform every other aspect of society, including politics. Politics is always downstream from culture. 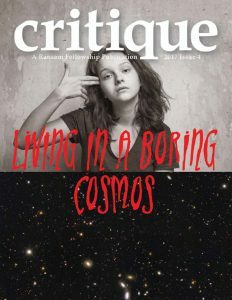 We need to remember that no matter how confident people might be in their secularism, from a Christian perspective they live in a boring universe. Human beings were not created to live in a world where there is no transcendent, no God or gods, nothing transpiring beyond the edges of space and time. The yearnings of the human heart include a deep desire for something more, for the hero who appears at just the right time to rescue the ones that are lost. We can relish poetry and stories that celebrate this messianic hope. We can drop hints that we see more than mere cause and effect in the unfolding of life, that we pray because more is going on than mere human effort, and that we can’t imagine being satisfied in a world in which the darkness of deep space is not filled with glory beyond our wildest dreams. In other words, we won’t see clearly and speak truly unless we have imagination to see life and reality with the eyes of faith. Christians living in a world of exclusive humanism must find significant time to nurture imagination through story. I don’t say this as a legalism, as an onerous task we must assume with the sigh. I’m saying we need to allow ourselves to be deliciously swept into good stories. It isn’t merely that our witness will suffer if we don’t, though it will, but that our souls will suffer. Just as we weren’t made to live in a world without windows, Christians are not born again to have stunted imaginations that struggle to see anything beyond the existence of bare facts. A year or two ago, I don’t remember when, Margie and I watched a nature documentary on television—I’ve forgotten which one, though I’ve searched for it. In any case, my memory of it is that we were shown magnificent images of northern lights, the aurora borealis. As we sat entranced watching the mysterious weaving streams of colored light sweep across the night sky the narrator spoke and said something like this: “Thanks to modern science we now know that the aurora borealis is not the traces of spirits dancing across the sky but collisions between electrically charged particles from the sun that enter the earth’s atmosphere.” Margie and I looked at each other and smiled. No, we said to each other. They are both, definitely, both. Don’t misunderstand: I am not about to produce some obscure text of scripture to “prove” that, nor am I going to guess what spiritual reality might be at work. All such silly speculation, I am convinced, is unbecoming to the Christian mind. I simply believe that obvious expressions of God’s glory involve more than highly charged particles. If we were sitting together in The House Between sharing coffee and wine, at this point in our conversation I would take a book off the shelf. Listen to this excerpt from The Voyage of the “Dawn Treader” by C. S. Lewis, one of the volumes in the Chronicles of Narnia. We find Caspian, Lucy, Edmund and Eustace are speaking to someone they know as the Old Man. This is fiction in the true meaning of that word. It is also an accurate reflection of the Christian view of existence in God’s good world. We see reality not merely as matter and energy but as multi-layered, rich in meaning, and alive to its creator. It is not static or dead, mindless cause and effect en route to extinction. It is God’s creation and he has not abandoned it even though it is now so broken as to be a glorious ruin, but is actively working to redeem and renew it, far as the curse is found. When we look out to the horizon we are gazing on a great stage in which the hosts of God serve grace in the face of an unrelenting onslaught of evil. We may feel bored today but the cosmos in which we dwell is anything but boring. So, Christian, what do you believe? Was the servant’s vision merely an irrational mystical experience meant to comfort but not to actually reveal what was truly there? Or were the horses and chariots both real and present? For myself, I don’t want to see them all the time (I have more that enough distractions already) but I want to live and talk as if I truly believe them there. Read Lewis’ science fiction trilogy, Out of the Silent Planet, Perelandra, and That Hideous Strength, and allow the sub-text of the stories sink deep into your heart and mind. Read St John’s Revelation, not as a puzzle to be solved (which it isn’t) but as an honest attempt by an intelligent man to relate what he saw and heard when God allowed him a glimpse of the end of the story. Read the rest of scripture asking the Holy Spirit to show you the glimpses found there of the deep and hidden aspects of reality. Read Neil Gaiman’s Norse Mythology, lingering over the stories to wonder why such a book finds an audience among young adults today. And though it is not for everyone, consider reading Gaiman’s American Gods, a fantasy that looks at America as a territory teeming with warring gods, some old like Odin and some new like Media and Technology. Watch the films that feature pagan gods as superheroes not merely as exciting entertainment but as a possible cry of a heart bored by a cosmos where our lonely voices echo off empty space. And learn, in community with fellow believers, how we might drop creatively intriguing hints of the story we inhabit that is more glorious than we can possibly comprehend. Have you ever noticed how often Jesus answers questions or makes statements in the gospels where it is not immediately obvious what he means? Or instances in which what he says is open to possible, even probable misunderstanding or offense? And it isn’t just us being confused. It isn’t just an issue of reading his words two millennia and in a different language and culture that makes what he says hard to understand. In some cases even his audience at the time wondered what he meant. And sometimes they were troubled enough by what he said to actually walk away. Consider the following text, and notice how there are four instances (note underlining) in Jesus’ conversation where we would think some clarity would be called for. The Jews then disputed among themselves, saying, ‘How can this man give us his flesh to eat?’ So Jesus said to them, ‘Truly, truly, I say to you, unless you eat the flesh of the Son of Man and drink his blood, you have no life in you. Whoever feeds on my flesh and drinks my blood has eternal life, and I will raise him up on the last day. For my flesh is true food, and my blood is true drink. Whoever feeds on my flesh and drinks my blood abides in me, and I in him. As the living Father sent me, and I live because of the Father, so whoever feeds on me, he also will live because of me. This is the bread that came down from heaven, not as the fathers ate and died. Whoever feeds on this bread will live forever.’ Jesus said these things in the synagogue, as he taught at Capernaum. As a boy growing up in the church I was troubled by these texts. I was troubled not because I couldn’t comprehend what Jesus meant, but by how preachers would tell us what Jesus actually meant to say in these texts, and in each case it was simple, obvious, straightforward, and utterly devoid of all mystery and all surprise. I always wondered why, if that is what Jesus really meant he didn’t say it. And why Jesus didn’t at least clarify things to those who stopped following him by providing these simple, obvious, straightforward explanations devoid of all mystery and surprise that the preachers assured us were what Jesus really meant. I see things very differently. I am convinced Jesus said exactly what he intended. He could have expressed himself differently but didn’t. And if he is our Lord we should be content with that. Everything wasn’t simple, obvious, straightforward, and utterly devoid of all mystery and all surprise because that is not what the truth is like. It is tempting to assume that we know a great deal about God, and redemption, and truth, and reality, and life, when we get to the end of all we know we find a bit of mystery. Not true. When we begin to seek insight into the things that matter most we find great mystery, in the midst of which God has revealed a few things that we see dimly and in part. What he has revealed about himself is sufficient and true, but he remains beyond all human knowing. He has spoken his word in creation, scripture and supremely in Christ, the living word, but we remain with far more questions than answers. The gospel is simple enough that a child can believe, but remains so rich in mystery that for eternity we will wonder, and then wonder some more. The scriptures reveal all that is needed for faith and life, and there is sufficient clarity in God’s revelation that we are without excuse. Nevertheless, there is mystery and surprise in the gospel as well as simplicity and clarity. If we don’t hold both, and display the reality of both, as Jesus did, it will be obvious we aren’t like Christ in the way we speak and live. Rather than wonder why Jesus couldn’t have been clearer we should ask why we sound so little like Jesus when we talk about the faith. St Paul prays “for all who have not seen me face to face, that their hearts may be encouraged, being knit together in love, to reach all the riches of full assurance of understanding and the knowledge of God’s mystery, which is Christ, in whom are hidden all the treasures of wisdom and knowledge” (Colossians 2:1-3). Some of what we say should sound mysterious not because we are muddled in what we believe, but because the truth we believe involves mystery and surprise beyond all knowing. If we believe the supernatural is real, that God exists and is our God, that the transcendent is not merely a pipe dream should there not be some evidence for it in our lives? The Lord taught us to pray not just for the kingdom to come, but for necessities of life, in other words for tangible as well as nontangible things (Matthew 6:9-13). 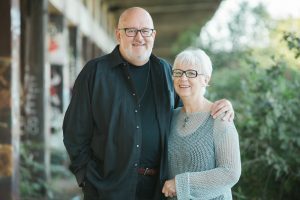 Margie and I have worked as Ransom Fellowship for over three decades. All during that time we have had to trust that God would work through the generosity of his people to supply our financial needs. As many of you probably know we do not ask for pledges, nor do we charge for Critique or Letters from The House Between, or for the material on Ransom’s website, nor do we raise funding from foundations. We are not secretive about Ransom’s needs—Margie mentions them as appropriate in Letters—but we do not engage in various traditional forms of fundraising. We have no problem with any of these other approaches to vocational ministry but felt strongly when we started that God was calling us to live by faith in terms of finances. In fact, we have helped others raise funds in some of these ways. But for ourselves, we pray and seek to trust God, and in different, often surprising ways God has provided the necessary funds for us to continue the work. Month by month, year by year he has been faithful, God’s people have been generous and we are very grateful. When we began back in 1982 several Christian leaders said it would never work. We were influenced by the example of Francis and Edith Schaeffer in L’Abri and simply determined that this was God’s particular call to us. It’s been a privilege to live this way. There have been times when income to Ransom was very low, and when we wondered if we could continue. Occasionally, during times of weariness I have wished I worked for a large corporation and didn’t need to wonder if my salary would be paid next month. Mainly though, watching God provide over so long a time has been remarkable, an ongoing demonstration of his existence, providence and care. We properly give thanks as Americans for living in a time and land of relative prosperity, but also know that this prosperity can make it difficult to walk by faith. “Trust in the Lord with all your heart,” the ancient Hebrews said, “and do not lean on your own understanding. In all your ways acknowledge him, and he will make straight your paths” (Proverbs 3:5-6). It’s easy to talk about walking by faith not by sight (2 Corinthians 5:7), and really believe it, but the fact is that few of us really need to trust God for much beyond our salvation in the next life. We pray for our daily bread but practically depend on a regular paycheck from a dependable employer. We pray for healing but go to the doctor and take the medications that are prescribed. And so it goes. 1. In what specific things do I need to trust God? 2. Are any of these things actual, tangible, and real as opposed to spiritual, unseen and untouchable? 3. What am I praying for that I can only receive through prayer and God’s gracious provision? 4. In what things can a non-Christian friend see that I demonstrate active and living faith in God? 5. When a non-Christian—particularly a secularist who does not accept the divine or the transcendent—challenges my claim to walk by faith, what can I point to as concrete evidence of the grace of God? The Christian life means living in the two halves of reality: the supernatural and the natural parts. I would suggest that it is perfectly possible for a Christian to be so infiltrated by twentieth-century thinking, that he lives most of his life as though the supernatural were not there. Indeed, I would suggest that all of us do this to some extent. The supernatural does not touch the Christian only at the new birth and then at his death, or at the second coming of Christ, leaving the believer on his own in a naturalistic world during all the time in between. Nothing could be further from the biblical view. Being a biblical Christian means living in the supernatural now, not only theoretically but in practice. Our task is to figure out what this can look like and then boldly pursue it. As we do so, we will be demonstrating that God exists, and even if no one believes as a result, we will have accomplished two things. We will have brought glory to the one who loves us unto death. And we will have lived in the reality that God created rather than a boring, empty one that exists only in the imaginations of those who insist there is no divine. BrainyQuote.com; GoodReads.com; True Spirituality by Francis A. Schaeffer (Wheaton, IL: Tyndale House Publishers; 1971) p. 64.